Diabetes is a metabolic disorder characterized by chronic hyperglycemia and impaired cytokine levels leading to inflammation. Interlukin-10 (IL-10) is an anti-inflammatory cytokine which acts as macrophage deactivator affecting the synthesis of TNF-a, IL-1, IL-6, IL-8 and GM-CSF. Single-nucleotide polymorphisms (SNPs) viz. -592A/C, -819T/C and -1082A/G in IL-10 promoter are associated with IL-10 production. Low IL-10 levels in T2DM cases may be regulated by such gene variants. The present study was undertaken to evaluate the association of two genetic polymorphisms viz. IL-10 -819T/C and -1082A/G with T2DM in a North Indian population. Blood samples from 402 subjects (201 each of controls and T2DM cases) were collected after ethical approval and individual written consent. All subjects were genotyped by polymerase chain reaction-restriction length polymorphism (PCR-RFLP) using specific primers and restriction enzymes. Genotypic, allelic, carriage rate frequencies were calculated and haplotypic analysis performed by SPSS (version 21.0) and SHEsis (online version). All biochemical parameters except WHR and TG showed significant association with T2DM (P<0.005). In the study population ‘TC’ genotype of -819T/C and ‘GG’ genotype of -1082A/G showed significant association with T2DM (P< 0.0001, OR=2.195; P<0.038, OR=1.946 respectively) while allelic frequencies did not show association. Individuals with genotypic combinations viz. CT/AG (+/-) and CT/GG (+/-, +/+) showed 2-4 times higher risk of developing T2DM while haplotype analysis did not show any association. 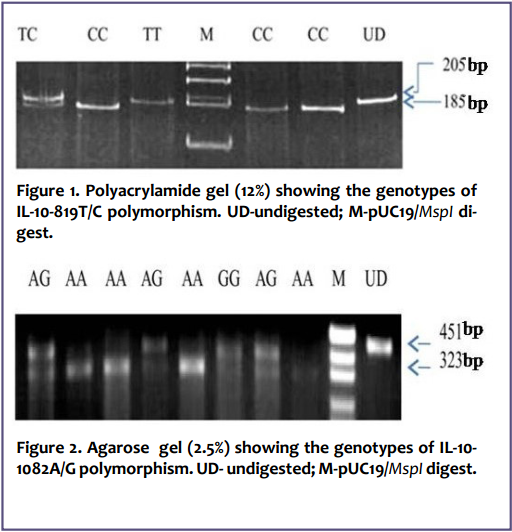 All genotypes of IL-10 polymorphism showed significant association with biochemical parameters viz. BPS, BPD, F, PP and TC (P<0.007). The IL-10 gene polymorphisms therefore play important roles in determining diabetes susceptibility.